Australia's Minister of Defense, Joel Fitzgibbon MP, has announced the appointment of Rear Admiral Rowan Moffitt to head its Defense Materiel Organization (DMO), Future Submarine Program (aka SEA 1000, follow-on to the Collins-class). Rowan will immediately assume responsibility for the submarine program and report to DMO, Capability Development Group Future Submarine Project Office headed by Dr. Stephen Gumley. The concept design phase1 is expected to take place between 2010-11 time period—IOC and Collins-class replacement around 2025. The new submarine will be built in Adelaide. A forthcoming government White Paper and Defence Capability Plan is expected to note the rising major powers of China2 and India are developing indigenous nuclear submarines. conventionally powered submarine for the RAN." UPDATED 03/01/2012 Austrialia DoD, 2011 Public Defence Capability Plan Primary discussion of the Future Submarine-Sea 1000 acquisition begins @ pg 255 and Australia DoD, Collins Class Sustainment Review Phase One Report (Coles Report). UPDATED 11/04/2009 Australia DoD, From Collins to Force 2030: The Challenge of the Future Submarine. The Honorable Greg Combet AM MP Minister for Defence Personnel, Materiel and Science speaking at the Sydney Institute, an open debate policy forum. The focus appears to be on leveraging existing design experience, design freeze before production, and strictly avoid any tendency to turn a pumpkin into a crystal coach3. UPDATED 05/05/2009 Australia DoD, Defence White Paper 2009. 9.3 For the reasons spelled out in Chapter 8, the Government has decided to acquire 12 new Future Submarines, to be assembled in South Australia. This will be a major design and construction program spanning three decades, and will be Australia''s largest ever single defence project. The Future Submarine will have greater range, longer endurance on patrol, and expanded capabilities compared to the current Collins class submarine. It will also be equipped with very secure real-time communications and be able to carry different mission payloads such as uninhabited underwater vehicles. 9.4 The Future Submarine will be capable of a range of tasks such as anti-ship and anti-submarine warfare; strategic strike; mine detection and mine-laying operations; intelligence collection; supporting special forces (including infiltration and exfiltration missions); and gathering battlespace data in support of operations. 9.5 Long transits and potentially short-notice contingencies in our primary operational environment demand high levels of mobility and endurance in the Future Submarine. The boats need to be able to undertake prolonged covert patrols over the full distance of our strategic approaches and in operational areas. They require low signatures across all spectrums, including at higher speeds. The Government has ruled out nuclear propulsion for these submarines. 9.6 The complex task of capability definition, design and construction must be undertaken without delay, given the long lead times and technical challenges involved. The Government has already directed that a dedicated project office be established for the Future Submarine within Defence, and will closely oversee this project. 9.7 The strategic importance of this capability is such that Australian industry involvement will need to be factored into the design, development and construction phases, and the sustainment and maintenance life cycle of these boats, which will extend well into the 2050s and possibly beyond. The Government will give early consideration to the complex capability definition and acquisition issues involved in this substantial undertaking. The Government will also consider matters such as basing and crewing, and will seek early advice from Defence on those and other issues. 9.8 For this project to succeed, we need to engage with a number of overseas partners during the design and development phase. In particular, the Government intends to continue the very close level of Australia-US collaboration in undersea warfare capability. This will be crucial in the development and through life management of the Future Submarine. 9.9 The Government has also agreed to further incremental upgrades to the Collins class submarines throughout the next decade, including new sonars, to ensure they remain highly effective through to their retirement. The construction program for the Future Submarines will be designed to provide the Government with the option to continue building additional submarines in the 2030s and beyond, should strategic circumstances require it. 9.10 The Government is determined to respond decisively to deficiencies in the current availability of operationally ready submarines. The Navy will embark on a major reform program to improve the availability of the Collins class fleet, and will also ensure that a solid foundation is laid for the expanded future submarine force. These reforms will change how we attract, remunerate, train and manage the submarine workforce, and improve the deployment and maintenance of the submarines. Pacific pivot attracts quieter and smarter submerged platforms, which may not necessarily mean more costly submarine platforms. UPDATED 04/26/2016 Reuters, France beats rival bidders to $40 billion Australian submarine deal and Age, France wins $50b contract to help build Australia's new submarines and CT, Submarine deal: What's $50 billion between besties? A DCNS conventional (Shortfin Block 1A) version of the nuclear Barracuda-class. YouTube, DCNS Shortfin Barracuda submarine, Australia Five background video playlist on the submarine deal. Defense minister welcomes submarine conference participants, who seem to be attempting the delivery of a follow-on submarine platform to the Collins-class, without first establishing a conception date. UPDATED 05/22/2013 Diplomat, Australia Needs Strategic Rethink on Submarines by Ross Babbage (also, Diplomat, Australia's Folly Article does not contain near enough analysis to justify its hyperbolic title). It's difficult to imagine a more optimal South Pacific Hemisphere anchor nation or Pacific submarine partner than Australia. It would be relatively easy and desirable for a Virginia-class submarine (VCS) producer to jointly transfer an indigenous VCS capability to the RAN as part of a lease or buy program. UPDATED 11/07/2009 UPI, Rand Corp. wins submarine design study. Part of the "make-buy" calculus. UPDATED 05/06/2009 AuBC, First new submarine contract awarded. Battery design. UPDATED 05/06/2009 The Australian, China a ''peaceful force'' in Beijing''s response to defence paper. UPDATED 02/24/2009 AuBC News, New submarine fleet a long way off. The report contains nothing new, seems just trying to dampen speculative excitement a bit. In submarines, absent a break-through in state of the art, a few key parameters cascade to define a particular class—many trade-offs occur within that class-definition. Sea 1000 is exciting precisely because of its potential for advancing submarine state-of-art—all submarine designers enthusiasts are already watching closely. 1. 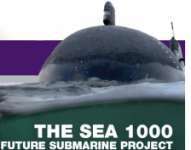 SEA 1000 is expected to have a larger diameter than the Collins-class (9.6 m, 31.49 ft verses 7.8, 25.59 ft). 2. UPDATED 03/05/2009 "Huludao" is currently thought to be the only China shipyard building nuclear submarines (see Misblog, China Submarine Force Structure 2010 Projection). Aerial map of submarine base and shipyard (aka Bohai shipyard). 3. The vital conceptual and applied submarine research is done in smaller discrete projects. When a "promising advance" is "mature" submarine policy makers and program managers begin looking at the feasibility of incorporating the advance into existing and future platforms. Modular designs, in general, will make forward fit and retrofit "more feasible", but sometimes you're just stuck with the pumpkin you produced.